On the morning of August 16th Inyo SAR was notified of two male climbers stranded on the East Arête of north summit of Split Mountain. One of the climbers was reported to have taken approximately a 30-foot lead fall the prior day (August 15th) suffering a 3 inch laceration to his right forearm and a possible coccyx injury. The injured climber and his partner managed to stop the bleeding and applied a pressure bandaged to the arm the evening of the accident. The two climbers were able to find a small ledge about half way up the route to bivy on for the night. The following morning Inyo County Sheriff’s department requested a CHP helicopter to aid Inyo SAR members in the rescue. CHP H-40 responded and was able to locate the climbers on their route over the Sierras from Fresno. H-40 continued onto Bishop where they rendezvoused with Inyo SAR members, refueled and “stripped” the helicopter in order prepare for a high elevation rescue. With a tentative plan of lowering a SAR member down to the climbers, the CHP H-40 and one Inyo SAR member lifted off from the Posse Hut helipad just before noon on the 16h. CHP H-40 was able to lower an Into SAR member down to the two men, where the rescuer quickly assessed the injured climber and then placed him into a Bauman Screamer suit (seated rescue harness). CHP H-40 returned to the arête and safely hoisted the injured climber safely off the rock ledge. 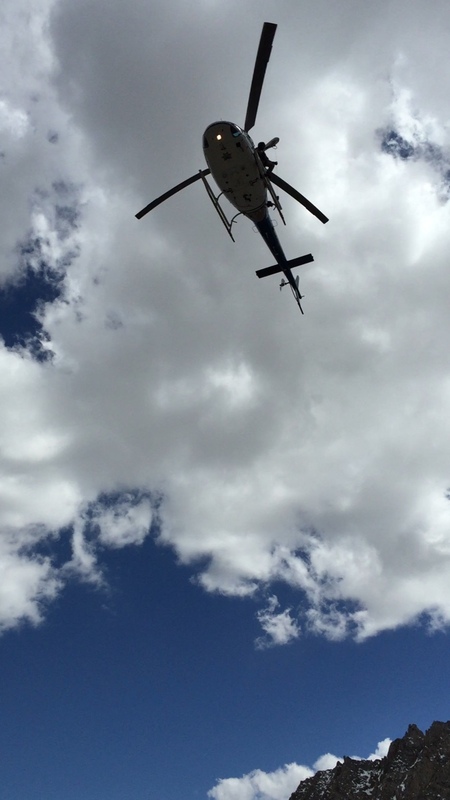 He was airlifted to Bishop Airport where Symons Ambulance assessed and transported him to Northern Inyo Hospital. H-40 returned to Split Mountain to pick off both the uninjured climber and the Inyo SAR rescue member. After safely hoisting both into the helicopter they were flown back to the Inyo County Posse Hut, where the uninjured climber was able to meet up with the reporting party. Total flight time for rescue was just over an hour. Inyo SAR would like to thank both CHP H-40 for the extrication and video footage, as well as Symons Ambulance for treating and transporting the injured climber to NIH. Other video provided by Scott Young via YouTube. Posted in 2015, Missions Reports.